On January 1, 1996 Wahunsenakah Lodge 333 was formed from the merger of Kecoughtan Lodge 463 and Chanco Lodge 483. 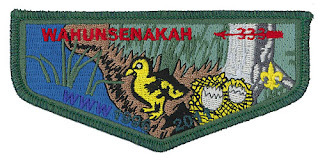 To celebrate the 15th anniversary of the formation of Wahunsenakah, the Lodge will issue a special commemorative flap patterned after its first flap that features a newly hatched baby duckling. Orders for the patch were taken earlier this year and they will be available for pickup at the Lodge's Winter Banquet on December 10. A limited number may be for sale for those who did not preorder. Thanks to George Homewood for the picture of the 15th Anniv. flap.